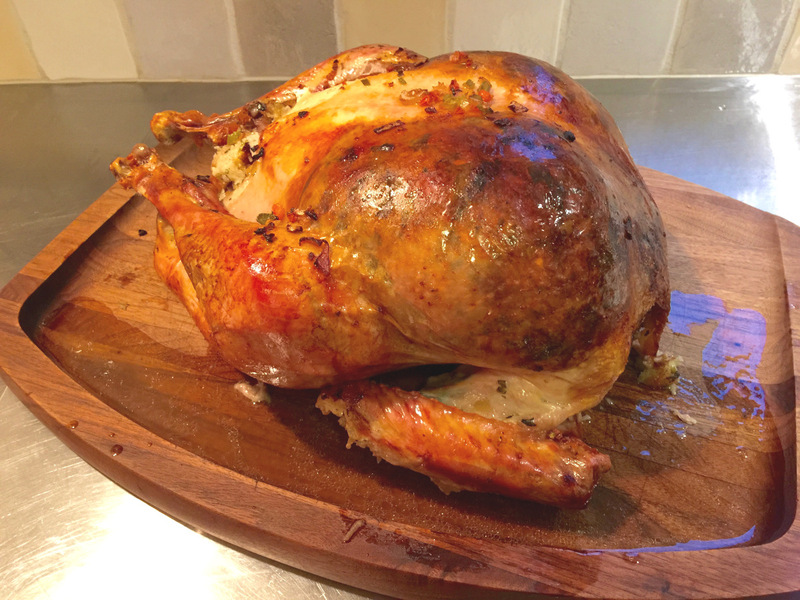 My time-tested, two way method for roasting a stuffed turkey guarantees a moist, juicy result! I cook this stuffed turkey and trimmings to have in the house for Thanksgiving weekend even when we’re spending the holiday on our own. I’ve been doing that for more than 25 years now, using my recipe that guarantees a perfectly roasted stuffed turkey in about 3-1/2 hours — one with delicious dressing, moist breast meat and juicy succulent dark meat. Fresh (no additives, which I prefer) or frozen (the best value) turkey, the result is always delicious. Based on a roasting method for chicken that I learned from the late Richard Olney in France, I stuff turkey two ways. First I pack a layer of my Sourdough Mushroom Turkey Stuffing between the meat and the skin on both sides of the turkey breast. Then I stuff the cavity and the neck skin. As we know, turkey is relatively lean and the primary issue is always the same: keeping the breast meat moist during the long roasting. There are many methods that claim to do this, from starting the bird upside down to layering butter-soaked cheesecloth on top. None offers the same protection for the white meat as stuffing under the skin does! The stuffing is literally insulation that traps steam rising from the turkey as it cooks and bastes the breast meat. As a bonus, the skin and stuffing merge into a crackling crust that is easily removed from the turkey to expose the breast meat for slicing. I have a great deal amount to say about cooking turkey – experience and information I’ve gathered over the years. Rather than clutter up the basic recipe (below) — which is already long because it’s detailed — I set up a Thanksgiving Turkey Cheat Sheet. That includes the entire panorama — from calculating what size turkey to buy, to cleaning it up for roasting. It also details the reasons I handle turkey in a way that is somewhat controversial in terms of government recommendations. Additionally, after checking out any number of turkey carving videos that I didn’t agree with, I found a good one, sponsored by Whole Foods. It features Top Chef winner Hosea Rosenberg whose carving method is easy to follow and yields attractive results. I’ve included it on the cheat sheet — if it’s needed, it’s there. This year I’m concentrating on the cooking. ⇒ To minimize cooking time, the turkey needs to be covered and removed the refrigerator 4 to 6 hours before stuffing and roasting. It must be put in the coolest place in the house — a room that’s between 55 and 65 degrees. Don’t put it any place warm! 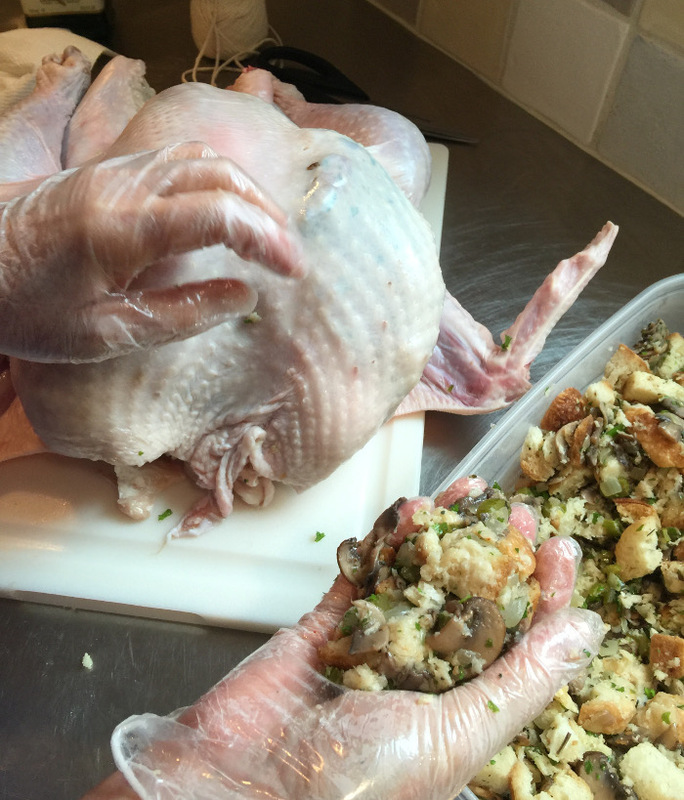 ⇒ Stuffing also needs to be removed from the refrigerator for 4 to 6 hours before placing it in the turkey. Because my stuffing contains no egg, there is no danger of it spoiling quickly. Use water instead of chicken stock to moisten the bread if you have any concerns. ⇒ I kick-start the cooking in a hot oven — 400° F — to seal in the juices. 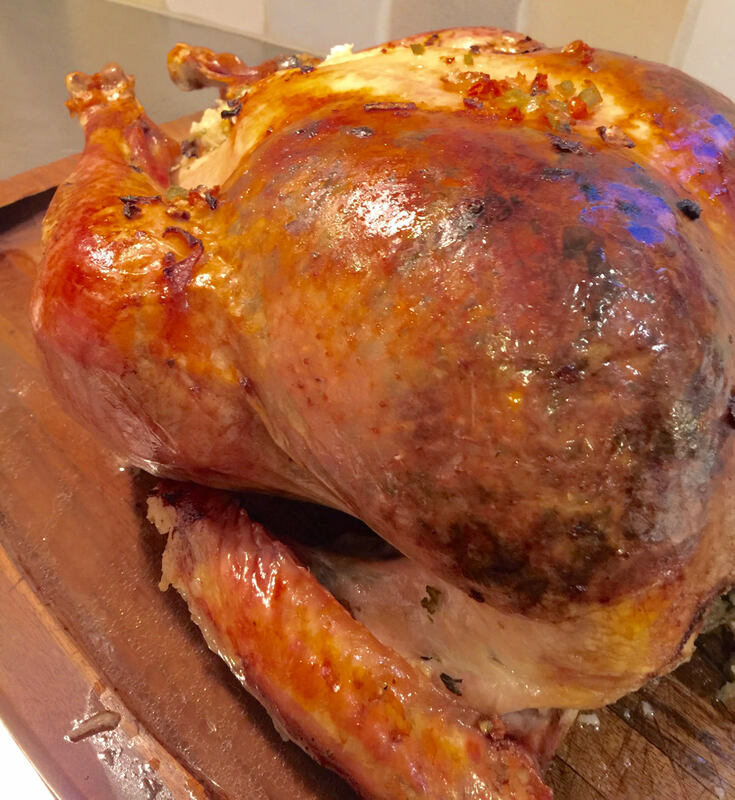 ⇒ And to get the turkey thoroughly cooked on time, I remove it from the oven for basting. I know, this is a chore. But: leaving the oven door open while basting slows down cooking time by as much as 30 percent! By removing the turkey, the oven temperature can remain more constant which helps get the turkey thoroughly cooked on time. Here’s how the turkey looks when it’s stuffed under the breast and neck skin plus the cavity, oiled, trussed, in the pan and ready to roast. 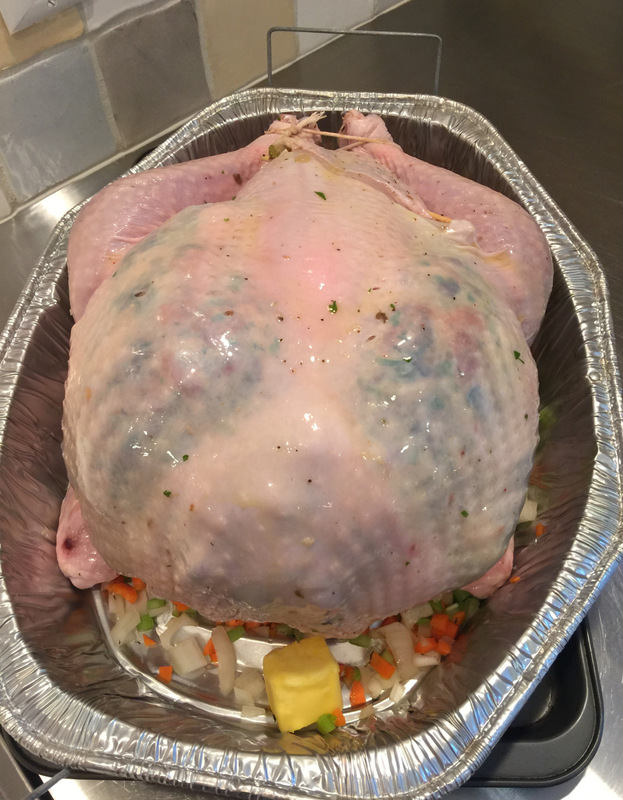 Here’s how the turkey looked before the first basting — after 25 minutes in the 400° F oven. 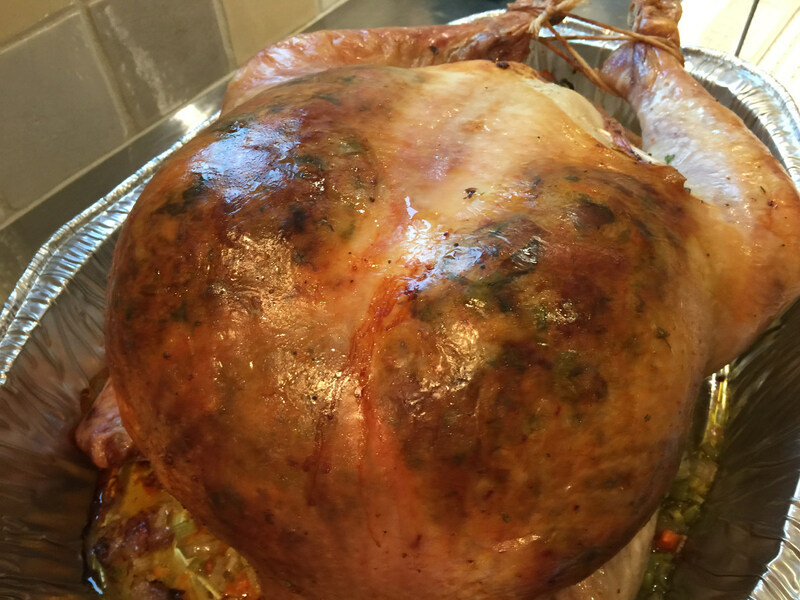 Here’s how the turkey looked about halfway through — about 1 hour and 30 minutes. Then I added the aluminum foil tent for the remaining 1-1/2 hours. Here’s how it emerged from the oven after the leg and breast were fully cooked (165°F) and before the final tented rest. Once the turkey is cooked, I collect the vegetables and all the basting liquid and simmer it down to make concentrated pan juices. I don’t generally thicken the juices although they can be strained and thickened for traditional gravy. And now, the recipe along with my wishes for a happy and delicious holiday. Put neck, heart and gizzard (giblets) in a large saucepan. Add 6 cups of the chicken broth. Cover and bring to a simmer over medium-high heat then, uncover and skim off the foam that rises. Reduce heat to a slow simmer and set cover slightly ajar. Slowly simmer for 3 hours, reducing liquid to 4 cups. Discard the heart and gizzard. Strip off meat from the neck, discard the bones and chop the meat coarsely. Refrigerate turkey neck meat for use later in the pan juices. Cool the basting broth then refrigerate until ready to use (up to 2 days). Before using, remove any fat on top of the broth. 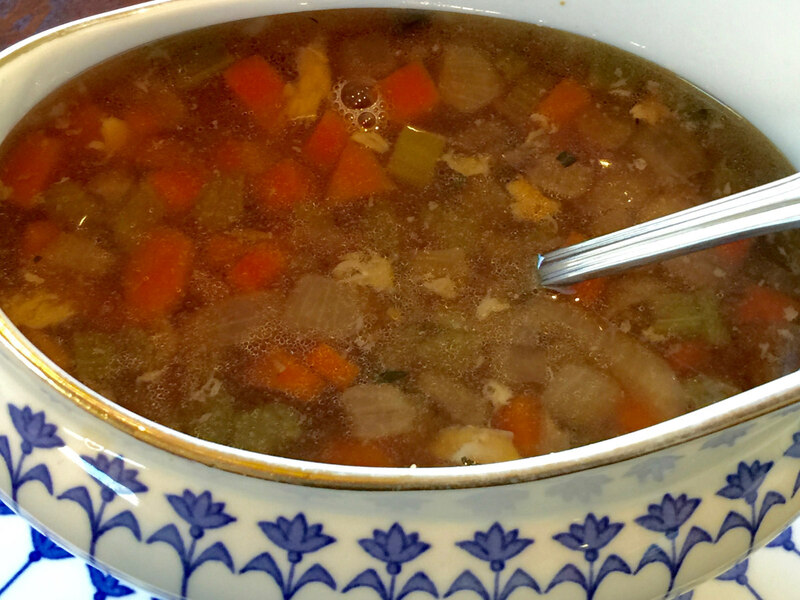 (Reserve 2 cups of the chicken broth in case there is not enough liquid for pan juices after roasting). At least 4 hours hours before roasting, remove the turkey from the refrigerator to a cool place (70 degrees F or below). Remove the prepared Sourdough Mushroom Stuffing from the refrigerator. Rinse turkey in ice cold water, drain well with the leg end down, and pat it dry inside and out repeatedly with paper toweling. Be sure to blot out any excess liquid or icy liquid inside the cavity, under the neck skin and beneath the wings. Cover the turkey loosely and let it stand at room temperature on a platter or pan large enough to catch any additional liquid from the turkey until shortly before cooking time. 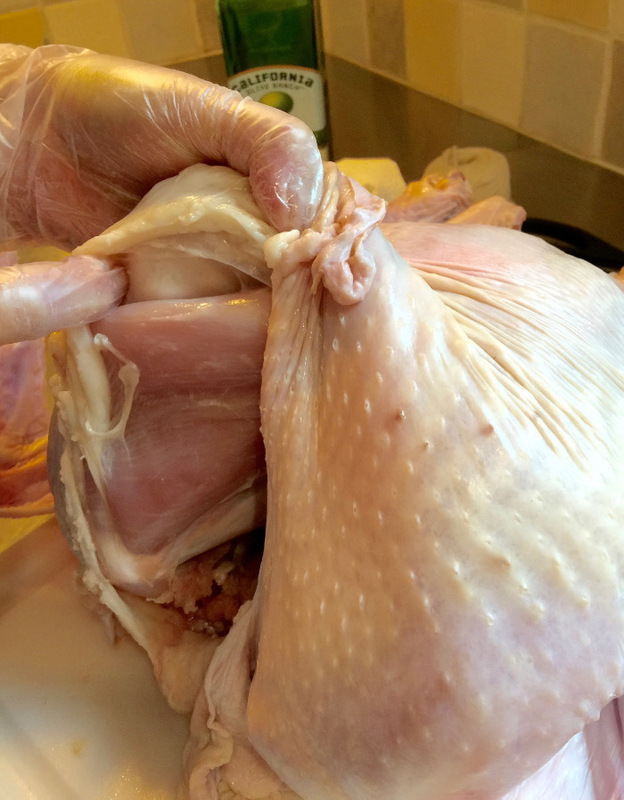 To make a a pocket for stuffing over each side of the turkey breast, turn the turkey so the neck end faces you. Lift up the neck skin, and with your fingers, feel for the connecting membrane the holds the skin onto the edge of the breast on one side. Carefully break through the connecting membrane, wedging your fingers in between the skin and breast meat. Work carefully to avoid making any holes. 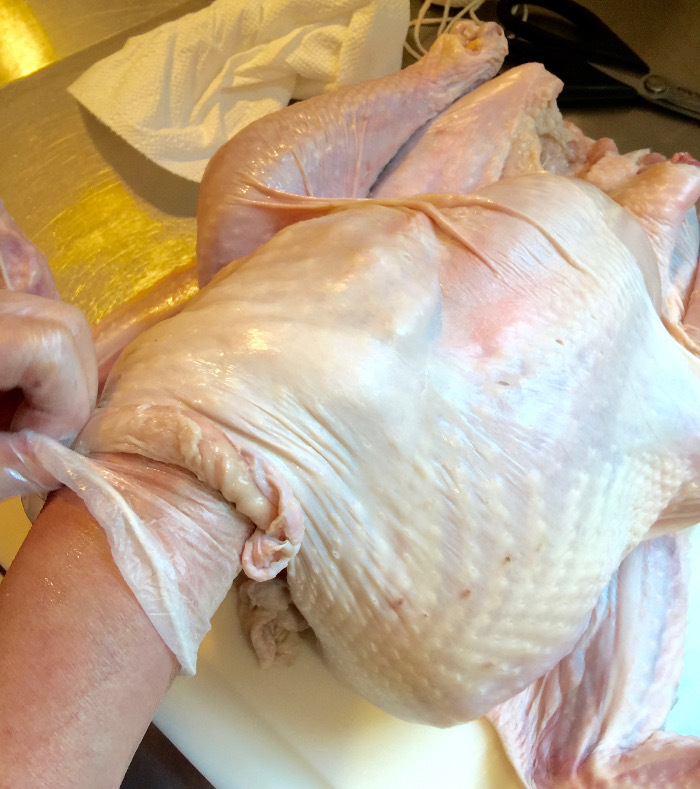 To enlarge the pocket, work your hand sideways and down towards the leg end but but be sure to leave a 1-inch margin of skin firmly attached to the breast all around otherwise stuffing will fall out. The skin will remain attached along the breast bone. Repeat to make a pocket over the other side. Lift up neck skin and push small wads of stuffing into the pocket on one side, working them down over the breast towards the leg end. Fill the pocket evenly with a 1-inch thick stuffing layer. Repeat to fill the other side. 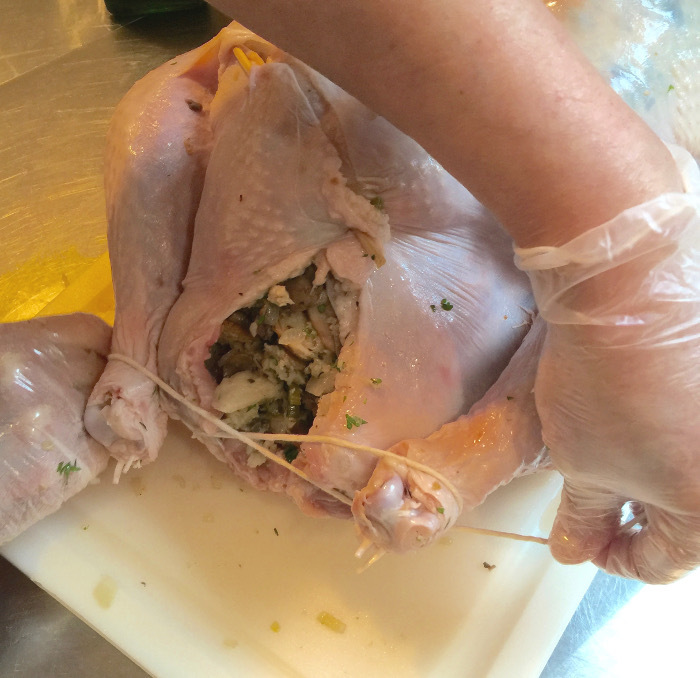 Press from outside to equalize stuffing and mold it to the counters of the breast. Then stuff neck loosely leaving enough skin to tuck under the turkey. Once again, pat the inside of the turkey dry again with paper toweling. Spoon remainder of the stuffing into the cavity, pushing it back with your hands. It may mound out slightly. To keep stuffing in, use butcher’s twine to make a figure 8 around the legs and tail, then pull the string until the leg come together tightly; knot and trim off excess string. 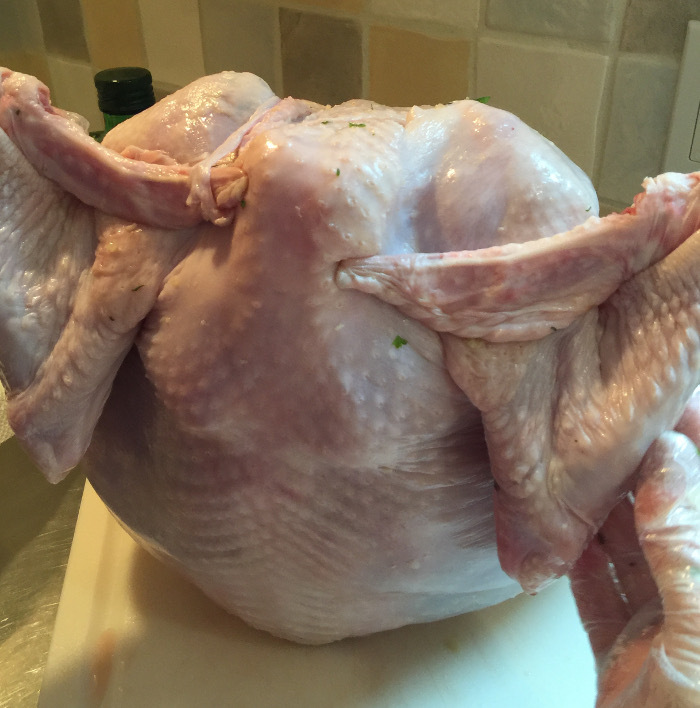 It is not necessary to truss or sew the turkey closed at the cavity end. (Any excess stuffing can be roasted separately). Pat the outside of the turkey dry with paper towels. Mix salt and pepper into 2 tablespoons of the oil and rub the seasoned oil over the turkey. 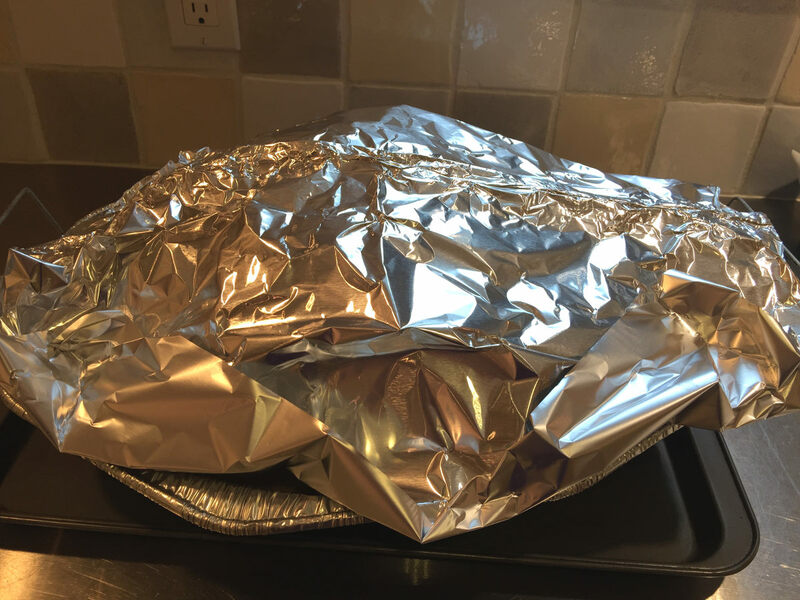 Prepare a foil tent for the turkey in advance by cutting aluminum foil long enough to cover the turkey in the roaster — usually 16- to 18-inches long depending on size. If wide, one sheet of foil may cover. If narrow, use two sheets of foil folded together to make the tent which will be using during cooking and again while the turkey rests. Adjust oven rack to lowest position. Heat oven to 400 degrees F.
Mix onion, carrots, celery and thyme and spread evenly over the bottom of a turkey roasting pan. Add butter and 1 tablespoon oil. Put turkey in the roasting pan, on top of the vegetables. Roast the turkey for 25 minutes. Carefully remove turkey from oven as quickly and carefully as possible and immediately close the oven door. Baste with 1 cup of the broth. Return turkey to oven as quickly and carefully as possible to maintain heat. Reduce oven heat to 325 degrees F. Roast 1 hour. Remove turkey and close oven door immediately. Stir vegetables around turkey as possible to prevent sticking. Baste turkey with 1 to 1-1/2 cups broth. 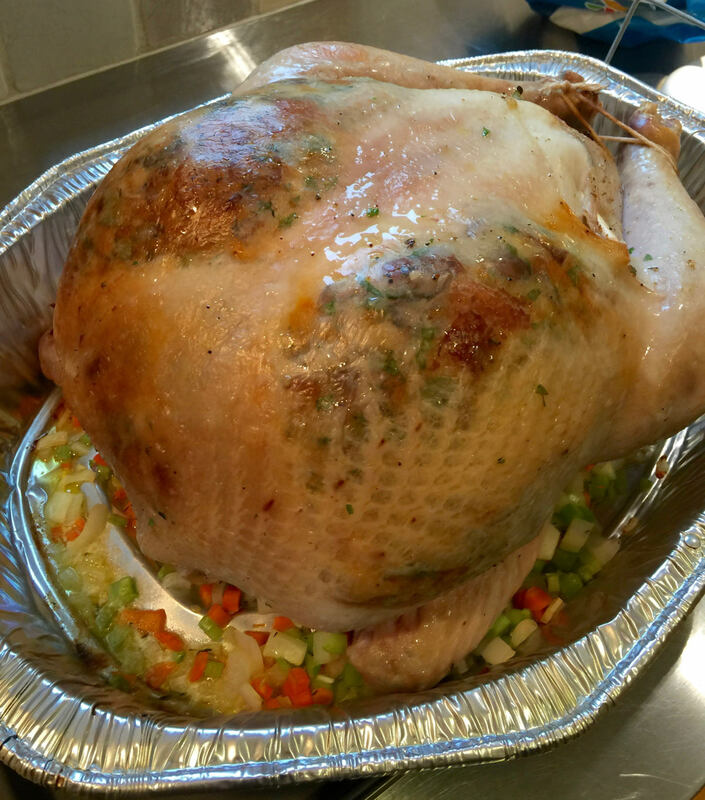 If turkey is medium brown, cover with the foil tent before returning turkey to the oven. Roast 1-1/2 to 2 hours more until skin is golden brown and juices run clear when a skewer is inserted into the thickest part of the thigh or an instant-read thermometer registers 165 degrees F.
Carefully transfer turkey to carving board or platter. Reserve vegetables and juices in the roasting pan — do not discard! Cover turkey with the foil tent and let stand 30 to 45 minutes before carving. While turkey rests, pour off all juices and vegetables from roasting pan into a medium saucepan, scraping the roasting pan well. Add any leftover basting broth (and reserved broth if there appears to be less than 4 cups total). If there are browned bits on the bottom of the roaster (usually the vegetables prevent this) add 1/2 cup hot stock and stir well, then strain that into the saucepan. Bring pan juices to a simmer over medium heat, skimming off all fat and any foam that rises to the top. Add the reserved chopped neck meat and simmer uncovered until liquid measures 3-1/2 cups. Adjust seasoning to taste with salt and pepper. Serve hot, spooning it over sliced turkey and stuffing. Turkey liver - can discard or cook and use as pet food. Fido or kitty will thank you. Celery - can include leaves in chopped celery as they are very flavorful. Always keep them to add to stock or soup. Pan Juices - Can heat, strain and reduce pan juices to 3 cups then thicken broth with a traditional roux, with 2 teaspoons to a tablespoon of arrowroot first dissolved in cold liquid. Turkey and Stuffing - My mud room is very cold, usually between 55 and 65 degrees F. That lets me leave the turkey and stuffing out 6 hours or overnight. If either are too cold, turkey will take longer than the recipe states to cook and risk dryness. Timing - Always stuff the turkey just before roasting — never ahead.